Staff at SGS Europe engaging in a mental health awareness session led by Hull and East Yorkshire Mind. SGS Packaging Europe has three busy offices in Hull, with a combined workforce of around 500 people. 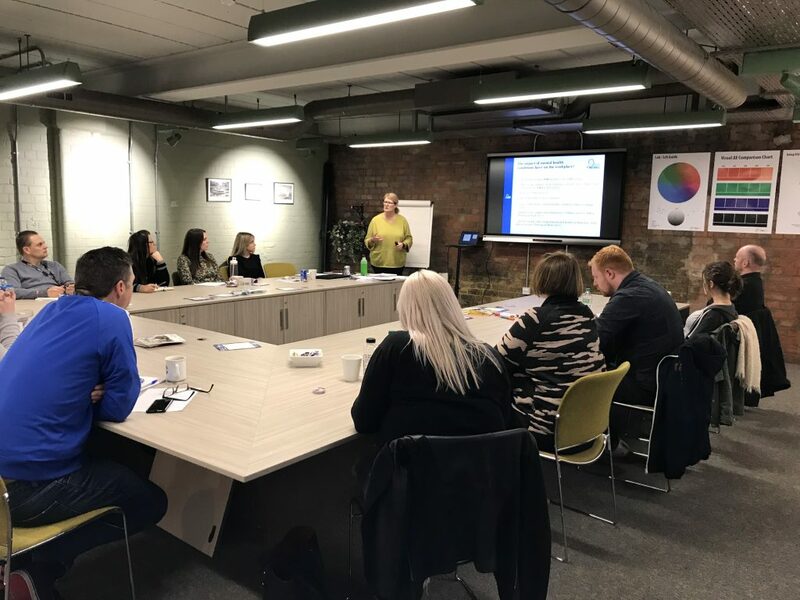 The company strives to not only provide everything its employees need to work creatively and efficiently, but also offers training and resources that ensure high levels of wellbeing for everyone. Whilst part of this promise takes the form of regular fundraising activities and participation in events such as the Hull 10K, the company has also recently built a strong partnership with Hull and East Yorkshire Mind, the charity that ensures anyone with a mental health problem has somewhere to turn to for information, advice and support. A recent development is a series of Mental Health Awareness sessions, run by Lorraine Hamilton, the Training Coordinator at HEY Mind. She visited the SGS offices to teach Managers and Team Leaders a range of topics and techniques that make a tangible difference in the daily running of a workplace. SGS and HEY Mind share a core value that positive mental health in the workplace increases productivity and ensures that staff are healthy, happy and feel valued in their roles. It benefits everyone, helping to create thriving surroundings and enhancing communication between a company’s management team, employees and clients. HEY Mind supports local businesses by providing information in a range of formats, including booklets on mental health issues, drop-ins, information stands, and all kinds of helpful activity through its website and social media channels. The charity also works in partnership with Hull City Council to support local businesses through the Time to Change pledge, which provides a framework for everyone in the workplace to feel confident in talking about their mental health. HEY Mind relies on funding and fundraising to deliver a variety of services to local people, which is why a team of apprentices at SGS have chosen it as one of their four beneficiaries for 2019. Through a range of year-round activity, the apprentices and their colleagues are raising money that will be split between HEY Mind, Hull Homeless Community Project, Yorkshire Cancer Research and Aaron’s Battle. If you’d like to add something to the pot, you can make a donation on their GoFundMe page. This is just the beginning of SGS Packaging Europe’s partnership with Hull and East Yorkshire Mind. With a variety of methods available through the charity for building a culture of openness, understanding and solidarity, this local company is committed to ensuring that all of its employees are confident, safe and happy in their roles. If you’d like to find out more about SGS Packaging Europe, you can follow them on Facebook, Twitter, Instagram and LinkedIn and sign up to job alerts on their careers page. Be the first to comment on "SGS Packaging Europe partners with Hull and East Yorkshire Mind"